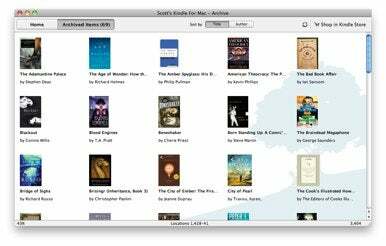 After months of anticipation, Amazon on Wednesday night released a beta of Kindle for Mac, software that lets you read Kindle e-books without the need for any special hardware (say, a Kindle). The free app for OS X 10.5 or later is available now in more than 100 countries, and joins the ranks of Kindle for iPhone, Kindle for PC, and Kindle for Blackberry. As with other Kindle products, the Kindle for Mac app uses Amazon’s Whispersync technology to synchronize your bookmarks and current place in your book across all supported devices. However, Kindle for Mac is in beta, and at the moment it doesn’t support full text search, highlighting, or creating and editing notes (though it will display notes and highlighting you’ve already made in your e-book elsewhere). Amazon promises these features in a future update. Interestingly, in the official press release, Amazon says people will soon be able to read Kindle books on iPads. Of course Kindle for iPhone should be able to run on the iPad, but it sounds like Amazon’s hinting that an optimized Kindle for iPad is in the works.